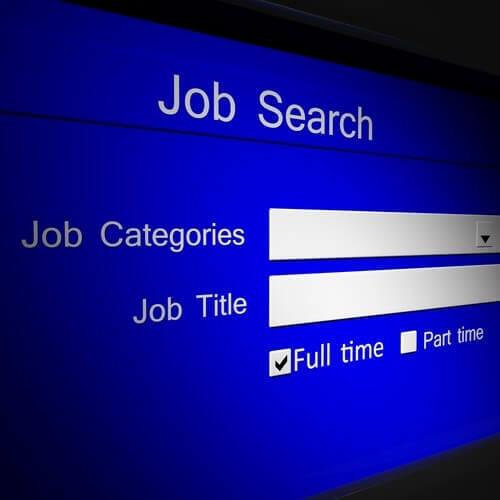 Online job search with a blue background. Photo courtesy of Shutterstock. Fake email addresses. Copycat web sites. Requests for personal information before a job is offered. Interviews conducted only via instant messaging. Promises of salary that are too good to be true. Requests to submit payment to move to the next step of the job search. These are just a few of the dirty tactics scumbags use to try and scam job seekers, including inexperienced job seekers like recent college grads and entry-level job seekers. The threat is real, and like any online or cyber threat, the people conducting the fraudulent activity are often trying to gather information to steal one’s identity or money. The team at College Recruiter takes the threat of job search scams and fake job postings seriously, and has implemented a multi-step process that identifies and blocks the vast majority of identity thieves and other scammers from ever posting a job to College Recruiter. In fact, every single job advertisement placed on College Recruiter goes through an in-depth verification process to prove the job posting is legitimate, and all ads are verified through actual contact with a human with the employer posting the job ad – something not every job board can claim. “Here at College Recruiter, we take these fraudulent attempts very seriously and work daily to ensure all the jobs that are posted on our web site are from verified employers to protect our job seekers from applying, interviewing, and becoming victims of identity theft,” says Dani Bennett, Sales and Client Services Manager at College Recruiter. Scammers created a false ad for Rio Tinto, one of the world’s largest metals and mining corporations. When a job seeker responded, the person who received the email asked for additional personal information, such as tax files, driver’s license, and birth certificate. Scammers then used this information to open credit cards and bank accounts. The messages from these so-called recruiters sound legitimate. In the Rio Tinto case, the recruitment email included an application with the company’s name and logo. Remember, anyone can set up a fake web site or email account, for example through free email providers like Gmail, Yahoo!, or Hotmail. College Recruiter, however, will not accept any job postings that use a free email provider to receive job applications. In another incident in Houston, scammers set up an actual interview, via Google hangout, using the name of a reputable company, and then offered a position. The scammers then asked the job seeker to move around large sums of money, in this scenario, up to $3,000. To carry this out, they sent fraudulent checks made out to the job seeker to start a home office, then asked the job seeker to forward that money to a third party vendor. In July, Shell Oil, one of America’s largest oil and natural gas producers with over 22,000 employees, posted a notice on its careers site warning job seekers that scammers were using the Shell name and logo to recruit for positions. Besides the obvious problem for job seekers, the toll these scams can take on a company’s reputation is huge, says Challenger. Most employers don’t know these fraudulent job postings are out there until they are contacted by job seekers who have figured out it’s a scam and contacted the legit company directly. By then, the company reputation is already damaged with those job seekers. “From a recruitment perspective, once a company’s brand has been associated with these fraudulent ads, it may be difficult to attract the talent needed when a position becomes available,” says Challenger. Not only do cyber criminals post fake job ads, unethical recruiters also post fake job ads, often on sites where they can post free job ads. Why would they do that? To act like they are “well-connected” and have a long list of candidates to choose from. A recruiter may submit these resumes to the employer for which they are hiring for, to show activity – which employers value when working with recruiters – and that they have an active pipeline of candidates, when they have no intentions of responding to, interviewing, or hiring these employees.